Travelers in Europe who are there specifically to look at the art—and even those who just stumble upon such treasures as Notre Dame de Paris—will see things they never saw before and learn more about things they already knew existed, with this delightful guidebook to the art and architecture of France. The main façade of Notre Dame, the authors explain, took more than one hundred years to build and features the work of dozens of architects and sculptors. During the lengthy construction process, the building would settle and the builders had to let the mortar set. Then, when work resumed, the same sculptors might not be available. Yet the spectacular façade of Notre Dame somehow manages to maintain an artistic uniformity. Even just looking at the color photographs of the cathedral takes on a new significance in the light of this historical information. Bill and Lorna Hannan are writers and travelers who love Paris and its art. They have worked as teachers, editors, journalists, and researchers in education and the arts, and have written textbooks that use graphics and design to teach creative writing. Here they offer a great deal of information in an entertaining style. 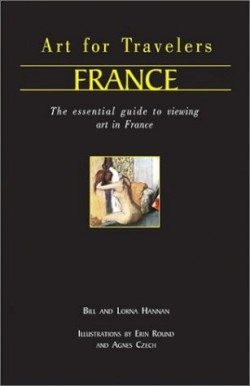 The authors aim to cover a wide variety of interests, including French Art of the Middle Ages, Impressionists and Post-Impressionists, 20th Century Art, and World Art in the Louvre. They provide brief biographies of the artists, architects, and sculptors whose work is described. The book is divided into four sections, with each section divided into “trails.” A typical itinerary is usually a half-day trip, but some cover long weekends. For the Musée d’Orsay, for instance, the authors recommend a “long half-day.” The beginning of each trail section lists the Paris Métro stop nearest the destination, and the opening times and admission fees, if any. The authors also mention likely spots to eat, have a cup of tea, or just rest between tours. The publisher has just released a similar book about Italy. Each trail description then goes on to tell, in minute detail, just about everything that an art-loving traveler can expect to see on that particular tour, room-by-room and even step-by-step. In Chartres, for instance, a “charming town about an hour southwest of Paris,” train travelers leave from the Gare Montparnasse in Paris and can see the outline of the church long before they reach the station; the cathedral is then within walking distance. The authors recommend the Jehan de Beauce as an affordable hotel for those wishing to make a night of it. After a brief history of the town of Chartres—including its status as an intellectual center in the eleventh century, and the religious relics that drew pilgrims—the authors provide great detail about the cathedral and its various parts, explaining the art and including helpful background stories. The Virgin Portal, for instance, on the right-hand doorway at the front of the church, tells the story of an angel visiting Mary, the mother of Jesus, to foretell the virgin birth. Then Mary visits her cousin Elizabeth, who is carrying the child who will become John the Baptist. There are also scenes of the Nativity. The book even mentions parts of the portal that may be missing, such as the animals or heavenly choirs that were likely once depicted. The authors’ attention to detail is extreme, and they include dates and possible inspirations throughout. Several glorious color photographs accompany all the descriptions of the art. There are illustrations, too, which are mainly explanatory, such as maps or labels of parts of a frieze. The book will easily fit into the front pocket of a backpack and promises to become dog-eared during the journey. Any traveler accompanied by this book will come away wiser for it.